The Stonfo Pettine Comb is a great little tool from Stonfo. 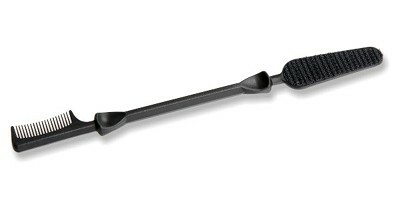 It combines a comb and Velcro brush into one handy little flytying tool.Great for combing out hair or teasing dubbing. Curved version of the ‘Ultimate’ Straight scissor. 4" long. A workhorse tool with longer, stronger blades and precision points. 4” long. Ultimate Taperizer - Deeper toothed, ideal for tapering synthetic wings and for stripping out dubbing. 4" long. This bodkin is a delightfully useful fly tying tool. The Hair Packer is an essential tool when tying deer hair flies. Polished stainless steel arms, knurled non-slip grip and smooth rotary mechanism. Magnet on end is useful for picking up hooks.